The production of an innovative, high performance graphene-based polymer nanocomposite using cost-effective techniques was pursued in this study. Well dispersed and uniformly distributed graphene platelets (g) within a polymer matrix, with strong interfacial bonding between the platelets and the matrix, provided an optimal nanocomposite system for industrial interest. 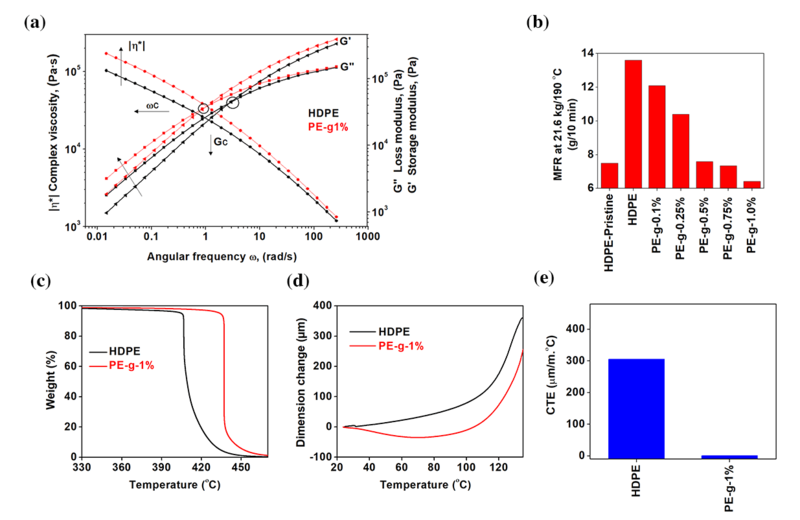 This study reports on the reinforcement of high molecular weight multimodal-high density polyethylene (HDPE) reinforced by a microwave-induced plasma graphene, using melt intercalation. The tailored process included designing a suitable screw configuration, paired with coordinating extruder conditions and blending techniques. This enabled the polymer to sufficiently degrade, predominantly through thermomechanical-degradation, as well as thermo-oxidative degradation, which subsequently created a suitable medium for the graphene sheets to disperse readily, and distribute evenly within the polymer matrix. The tailored process included designing a suitable screw configuration, paired with coordinating extruder conditions and blending techniques. This subsequently created a suitable medium for the graphene platelets to disperse readily, and distribute thoroughly within the multimodal-HDPE matrix, as demonstrated in Figure 1a,c. The mean particle size of the detected graphene particles and %area fraction (200x200 µm2) was around 0.5 µm2 and 0.0063, respectively. 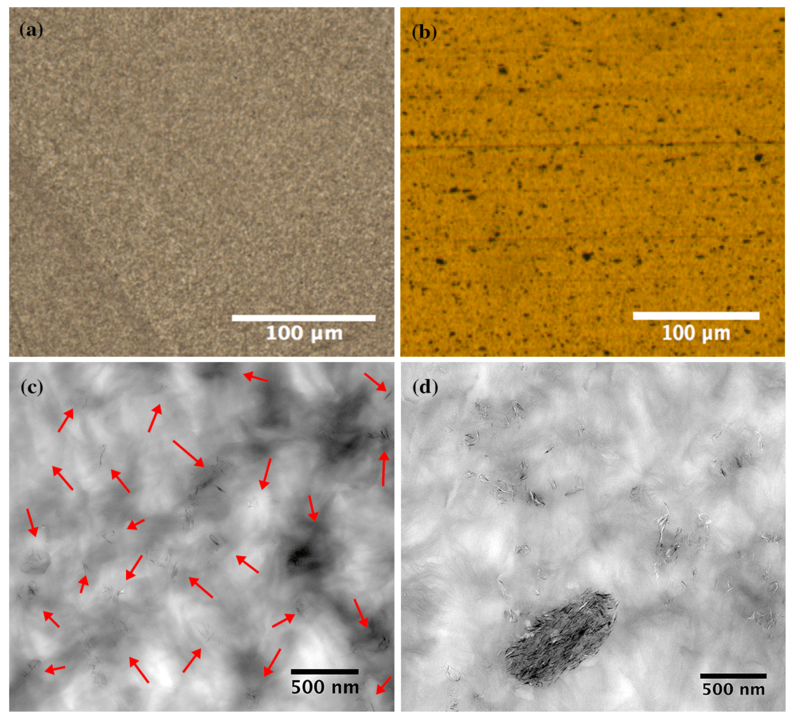 For the nanocomposite produced using the pre-existing commercial approach, however, the mean particle size of the graphene agglomerates was calculated to be 4.12 µm2, with maximum particle size of around 4.7 µm2, and a %area fraction of 79.4 (see Figure 1b,d). The %area fraction and mean particle size were calculated based on transmission electron microscope (TEM) and light microscopy analysis, graphene particles of less than 0.05 µm2 or 500 nm were excluded from the calculations, i.e. the average lateral size of graphene platelets ranges between 150-500 nm. A decrease in the %area fraction means a better distribution and fewer agglomerates. Figure 1. (a-b) Light microscopy images and (c-d) TEM images show the dispersion and distribution of 1 wt.% loading of graphene platelets within the multimodal-HDPE matrix. Images for the similar nanocomposite produced by a pre-existing processing protocol (right), were compared with PE-g-1% produced in this study (left). The TEM and light microscopy images were taken at 10k and 20x, respectively. The interfacial adhesion strength between graphene sheets and polymer matrix can be explored through the microscopic examination of cryofractured cross-section surfaces. Shown in Figure 2a is an SEM image of the neat multimodal-HDPE surface exposed by cryofracture. The SEM micrograph exhibits fibrils with various extents of surface fibrillation in the draw direction. The occurrence of fibrils may suggest that the fracture was due to chain slippage or scission in crystalline (long fibrils) and amorphous (short fibrils) regions. Contrastingly, graphene was shown to have a significant effect on the microstructure of the adjacent polymer as evident by changes to the fibrous morphology of the PE-g-1% shown in Figure 2b. The SEM micrograph of the nanocomposite exhibits a number of graphene platelets protruding out of the fracture surface of the polymer matrix, i.e. embedded and strongly tied to the matrix. Figure 2. Assessment of the interfacial adhesion strength between graphene sheets and polymer matrix. SEM images of a cross-section fracture surface from (a) neat multimodal-HDPE and (b) PE-g-1%. (c) Dynamic-Thermomechanical Analysis (DTMA) of the neat multimodal-HDPE and PE-g-1%. (d) Tensile stress-strain curves for the pristine multimodal-HDPE (nonextruded), neat multimodal-HDPE (extruded), and PE-g-1%. The pristine polymer is the powder polyethylene. (e) Shift with strain of the 2D and G Raman bands of the graphene during deformation upon PE-g-1% nanocomposite (Laser excitation energy 2.33 eV). The corresponding 2D and G Raman shifts as a function of applied strain are shown in the two graphs on the right. These flakes are well dispersed and evenly distributed within the multimodal-HDPE matrix, which may have formed a continually interconnected network structure throughout the matrix. Interestingly, the fractured surface of the nanocomposite become rough, compared to that of the unfilled multimodal-HDPE. Conceptually, the fracture toughness is quantified by the amount of the energy absorbed per unit crack extension. Therefore, the significant change in the breaking (crack propagation) mechanism accordingly suggests that the strong interfacial bonding between the polymer matrix and graphene platelets likely split the material into cavities and molecular bundles under large loading . The facilitated stress transfer along the large interfacial area between the reinforcement and matrix is expected to potentially display mechanical reinforcement. In Figure 5c, the storage modulus measured by dynamic thermomechanical analysis (DTMA) increased by 75%, 84%, and 118% at -100 ºC, -50 ºC, and 23.5 ºC, respectively. The tensile modulus increased by ≥35%, from 835 ± 13 MPa for neat multimodal-HDPE, to 1135 ± 17 MPa for PE-g-1%, as shown in Figure 5d. Moreover, the maximum tensile strain increased by 11%, from 615 ± 43 % for neat multimodal (extruded), to 680 ± 31% for the PE-g-1%. This increase in the tensile strain was possibly preceded by a prolonged exposure of the neat polymer to a high temperature in the extruder, under a combined high shear and elongation forces. Thus, graphene has most likely acted as an antioxidant and protected the polymer from excessive thermo-oxidative degradation. The maximum tensile strain of the nanocomposite is therefore compared to a non-extruded multimodal-HDPE for verification. Interestingly, the tensile strain decreased from >800% for neat multimodal-HDPE (non-extruded) to only 680 ± 31% for the PE-g-1%. This latter subject will be discussed in greater detail later in this study. Nevertheless, this indicates that graphene reinforced the polymer through the heat transfer from the polymer matrix to graphene platelets along the interface. The interfacial adhesion strength between the polymer matrix and graphene platelets was further investigated by the stress-induced Raman band shifts. In Figure 2e, the 2D and G Raman bands of graphene in a nanocomposite shifted to higher wavenumbers as a function of applied strain, suggesting that the graphene platelets went into biaxial compresion as reported in the literature. Beyond ~9% strain however, these two bands reverted closer to that of the unstrained peak positions, due to relaxation of the graphene sheets upon debonding between the nanocomposite constituents. The 2D and G Raman bands have significantly downshifted after ~9% strain, by ~34 cm-1 and 28 cm-1, respectively. Surprisingly, the 9% strain is around the yield point as can be seen in the stress-strain curve shown in Figure 2d. Overall, the results show that a strong interfacial bonding is created between graphene sheets and polymer matrix. Figure 3. Thermal stability performance and rheological behaviors. (a) Dynamic frequency sweep measurements performed at 190 °C. wC is the crossover frequency point and GC is the crossover modulus point in a log-log scale. (b) MFR measurements of PE-g nanocomposites as a function of graphene loading (0.1, 0.25, 0.5, 0.75, and 1.0 wt.%). (c) Thermogravimetric thermograms performed in N2 atmosphere. (d) Dimensional change as a function of temperature. (e) Coefficient of thermal expansion (CTE) measured at temperature difference range of 30-105 °C. Figure 3a-b shows the rheological behaviour of neat multimodal-HDPE and PE-g-1%. Shown in Figure 3a is the pseudoplastic, non-Newtonian behavior of the viscoelastic polymer. The influence of graphene on the viscoelastic response of the polymer is revealed from the change in the absolute values of the storage (G’) and loss (G”) moduli, as well as their frequency dependence . At a high shear rate, both materials exhibited thinning behavior, which resulted in a decrease of extensional viscosity. However, the incorporation of 1 wt.% graphene increased the melt viscosity of the nanocomposite, though the relative increase gradually lessened at high shear rate. The presence of graphene has considerably increased the pseudoplasticity at a low shear rate region. At the angular frequency (w) of 0.0154 rad/s, the complex viscosity increased from 0.13 MPa·s for neat multimodal-HDPE to 0.24 MPa·s for the PE-g-1%. Furthermore, the loss and storage moduli of the neat polymer increased by a value of 92% and 77% with 1 wt.% loading of graphene, respectively. The greater amount of storage and loss moduli of PE-g-1% suggests that the formation of a strong interfacial bonding between the polymer matrix and the high-modulus graphene reduced the loss tangent, the nanocomposite accordingly became more elastic. This is in addition to the thorough dispersion and distribution of the nanofillers, which led to a decrease in the degree of the chain mobility of the polymers, and thus suppressed the shear flow of the polyethylene macromolecular chains. In addition, the crossover modulus point (GC) and crossover frequency point (wC) have decreased from 0.044 MPa·s and 4.5 rad/s for the neat multimodal-HDPE to 0.035 MPa·s and 1.2 rad/s for PE-g-1%, respectively. The shift of wC to lower region indicates that the nanocomposite exhibited higher average molecular mass and/or the entangled molecules were induced by the three-dimensional network of graphene platelets within the matrix. However, the GC shifting to lower values after the reinforcement indicates that the polymer exhibited broader molecular weight distribution, which is evident from the increase in the polydispersity index (PDI) by 18.4%, i.e. the larger the PDI, the broader the molecular weight distribution. The shift of Gc upon the addition of the reinforcement possibly arose also from exposing the neat polymer to high temperature, under a combination of high shear and elongation forces, for a prolonged period of time. In Figure 3b, the melt flow rate (MFR) of the extruded multimodal-HDPE decreased gradually from 13.6 g/min to only 6.42 g/min with 1 wt.% graphene loading at 21.6 kg/190 °C, whilst the MFR of the pristine multimodal-HDPE (nonextruded) was only was only 7.5 g/min. The lower the MFR, the higher the molecular weight or the viscosity. This indicates that graphene acted as a thermal barrier and enhanced the thermal stability of the polymer through the strong interface bonding. The synergistic effect advantages of graphene are further investigated by thermal expansion and thermogravimetric analyses (TGA). As shown from the TGA thermograms in Figure 3c, the onset degradation temperature of PE-g-1% increased significantly by more 31 °C. The onset temperature at 5% mass loss (T5%) of neat multimodal-HDPE increased from 405 °C to 434.2 °C upon 1 wt.% loading of graphene. The reinforced polymers exhibited a greater melt strength during thermoforming such that the sagging resistance of the nanocomposite has been improved. The large aspect ratio of graphene with a platelet structure likely offered a larger interfacial surface with the polymer matrix which in turn slowed the diffusion of the decomposition products from a continuous network-structured protective layer created in the nanocomposite. It would seem as though graphene acted as an antioxidant and consequently protected the polymer from excessive thermal degradation. The polymer could therefore be extruded in aggressive conditions, for example with a screw configuration of 37% of dispersive elements at a very low feed rate. This also implies that the amount of thermo-mechanical and thermo-oxidative degradations achieved was sufficient enough to produce an efficient reinforcement. 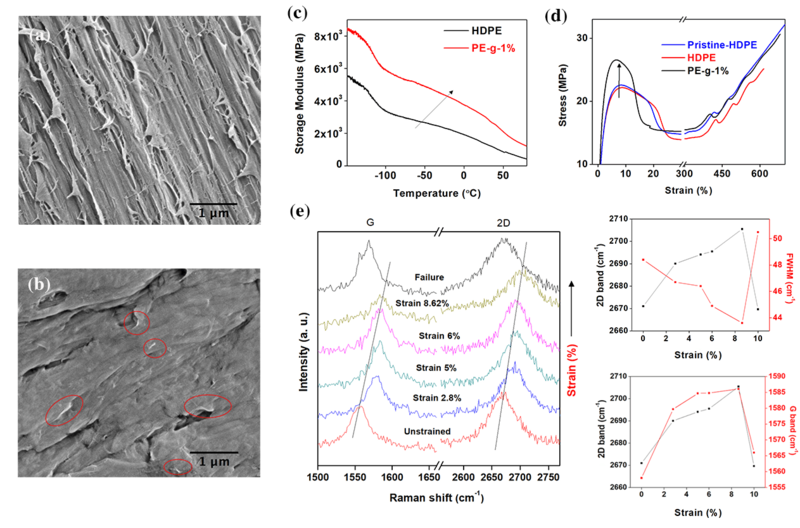 This was achieved through the formation of a strong interfacial adhesion bond between the polymer matrix and graphene platelets, which has accordingly enhanced the thermal stability of the polymer. The coefficient of thermal expansion (CTE) of the PE-g-1% was calculated to be 0.55 X 10-6 °C-1 over the temperature range of 30–103 °C, as shown in Figure 3d-e. The CTE started to become positive after 100 °C confirming that graphene sheets are well bonded with the polymer matrix, and suggests the continuous interconnected network structure formed in the polymer matrix hindered the reorientation of the polymer chains. Mounet et al., Zakharchenko et al., Yoon et al., Bao et al., and others found that graphene has negative thermal expansion at low temperatures . Mounet et al. used a first-principles calculation, and estimated the CTE of graphene remains negative up to 2500 K. Zakharchenko et al. found that the transition from negative to positive CTE occurs at ~900 K. The CTE of a single layer graphene measured by Yoon et al. via temperature-dependent Raman spectroscopy remained negative in the temperature range of 200–400 K. Therefore, it is not yet clear at what exact point the CTE changes from negative to positive. John E. Proctor; Eugene Gregoryanz; Konstantin S. Novoselov; Mustafa Lotya; Jonathan N. Coleman; Matthew P. Halsall; High-pressure Raman spectroscopy of graphene. Phys. Rev. B 2009, 80, 73408, 10.1103/physrevb.80.073408. Iti Srivastava; Rutvik J. Mehta; Zhong-Zhen Yu; Linda Schadler; Nikhil Koratkar; Raman study of interfacial load transfer in graphene nanocomposites. Applied Physics Letters 2011, 98, 63102, 10.1063/1.3552685. Yuyoung Shin; Marcelo Lozada-Hidalgo; Jose L. Sambricio; Irina V. Grigorieva; Andre K. Geim; Cinzia Casiraghi; Raman spectroscopy of highly pressurized graphene membranes. Applied Physics Letters 2016, 108, 221907, 10.1063/1.4952972. Lei Gong; Robert J. Young; Ian A. Kinloch; Ibtsam Riaz; Rashid Jalil; Kostya S. Novoselov; Optimizing the Reinforcement of Polymer-Based Nanocomposites by Graphene. ACS Nano 2012, 6, 2086-2095, 10.1021/nn203917d. Mezger, T. G. The Rheology Handbook; Vincentz Network: Hanover, 2014; pp. 1-432. Nicolas Mounet; Nicola Marzari; First-principles determination of the structural, vibrational and thermodynamic properties of diamond, graphite, and derivatives. Physical Review B 2005, 71, 205214, 10.1103/physrevb.71.205214. K. V. Zakharchenko; M. I. Katsnelson; A. Fasolino; Finite Temperature Lattice Properties of Graphene beyond the Quasiharmonic Approximation. Physical Review Letters 2009, 102, 046808, 10.1103/physrevlett.102.046808. Duhee Yoon; Young-Woo Son; Hyeonsik Cheong; Negative Thermal Expansion Coefficient of Graphene Measured by Raman Spectroscopy. Nano Letters 2011, 11, 3227-3231, 10.1021/nl201488g. Wenzhong Bao; Feng Miao; Zhen Chen; Hang Zhang; Wanyoung Jang; Chris Dames; Chun Ning Lau; Controlled ripple texturing of suspended graphene and ultrathin graphite membranes. Nat. Nanotechnol. 2009, 4, 562-566, 10.1038/nnano.2009.191.